What do you do when you can't sleep but it feels way too early to leap out of bed and launch into the new day? 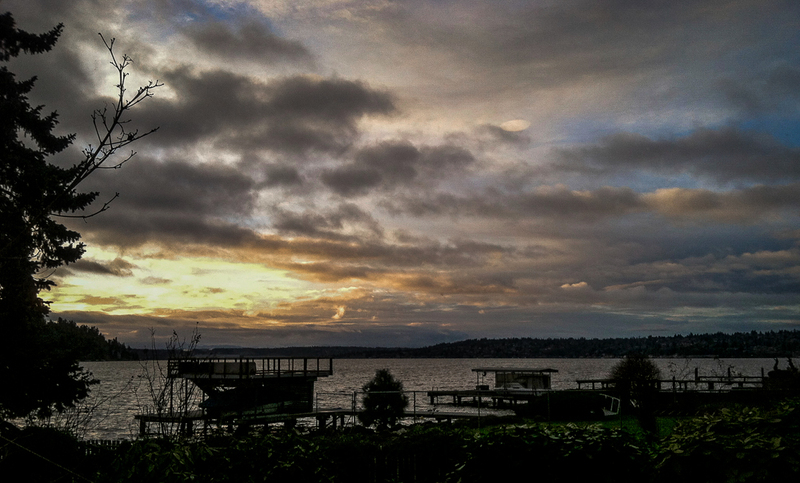 Some days I read, or watch the morning news and market activity, or contemplate life until I do fall back asleep. Today a glance outside confirmed changeable weather heading our way, not at all inviting for an early morning walk. I chose to stay in my pajamas and headed downstairs to start the coffee. 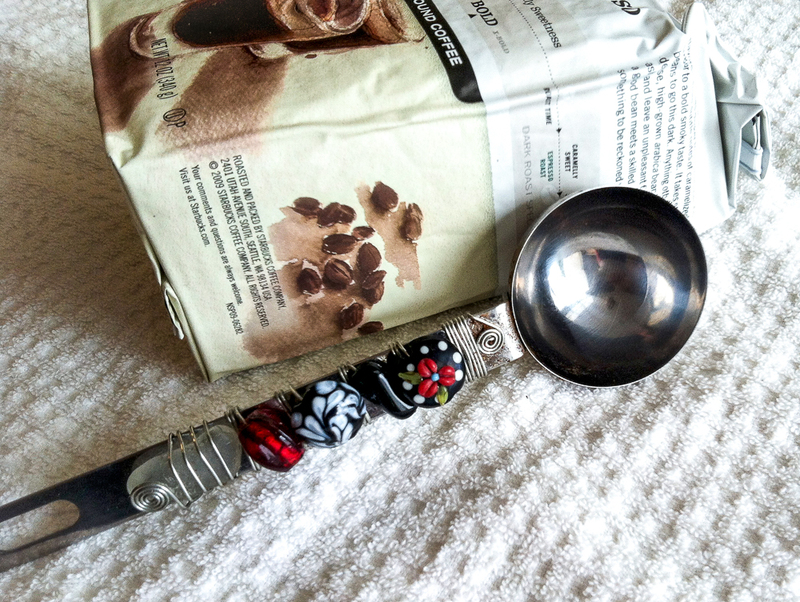 No problem, until I couldn't find my favorite coffee scoop. It turned up eventually, mixed up with other utensils in a drawer where it doesn't normally reside. After making the coffee I set about straightening the drawer, muttering only slightly about where RL had stored stuff. He likes to reorganize things and "make the kitchen more efficient". Grrrrrrrrr. 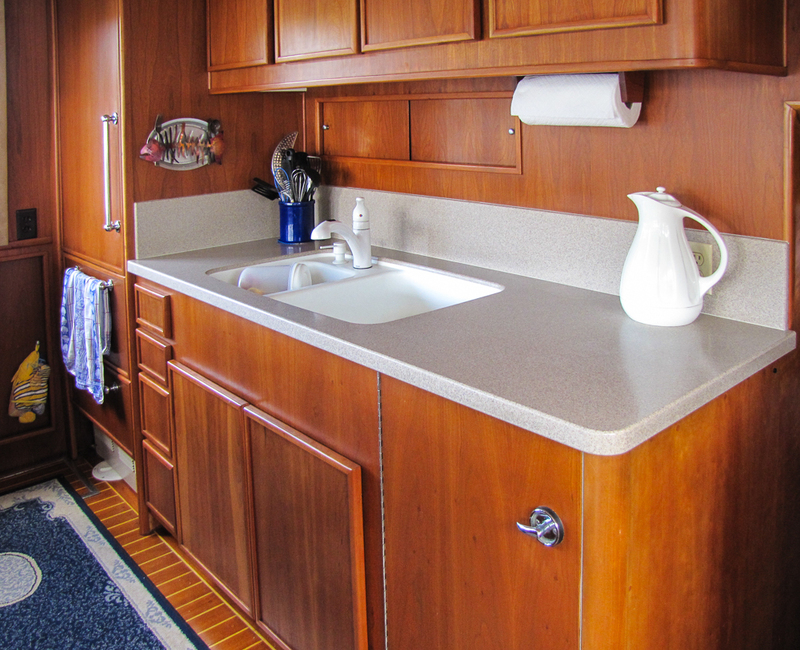 This only happens in the house kitchen since the boat galley has such limited storage space (4 drawers in all). 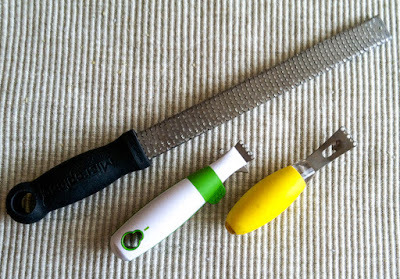 Organizing one kitchen drawer led to a second, then a third, and I became aware of the number of single-purpose items in my utensil collection here ashore. How many other cooks of a certain age share my apparent fondness for kitchen gadgets, or my inability to toss the excess? Instead of sharing new "stuff" or food items in my kitchen this month, here's a peek at a few of the items I evidently find too precious to part with. 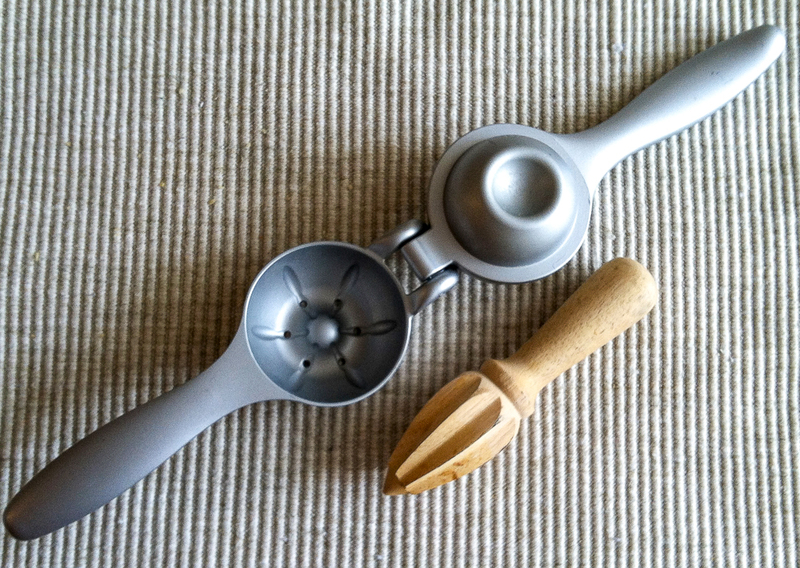 -2 citrus juicers, both of which require significant hand strength and dexterity. -a rice mold that is often forgotten, so I'll use a measuring cup instead. 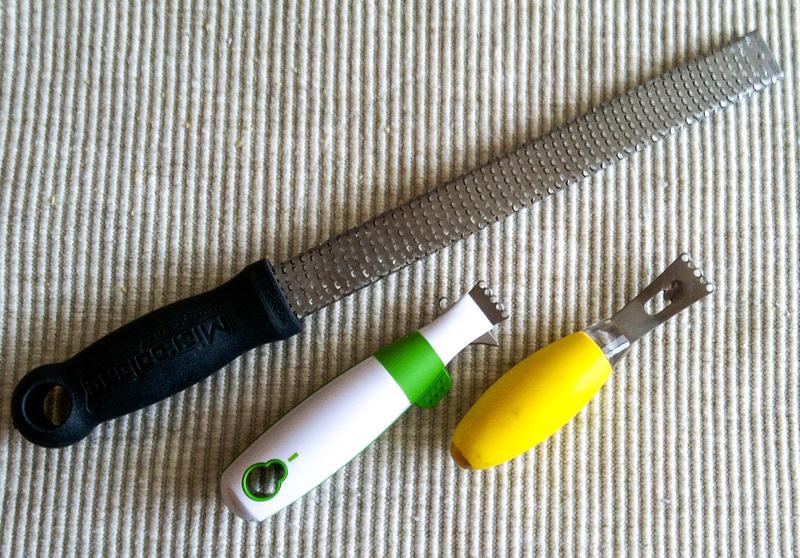 -3 zesters, though only the long grater gets significant use. -an olive ladle with almost useful drain holes. 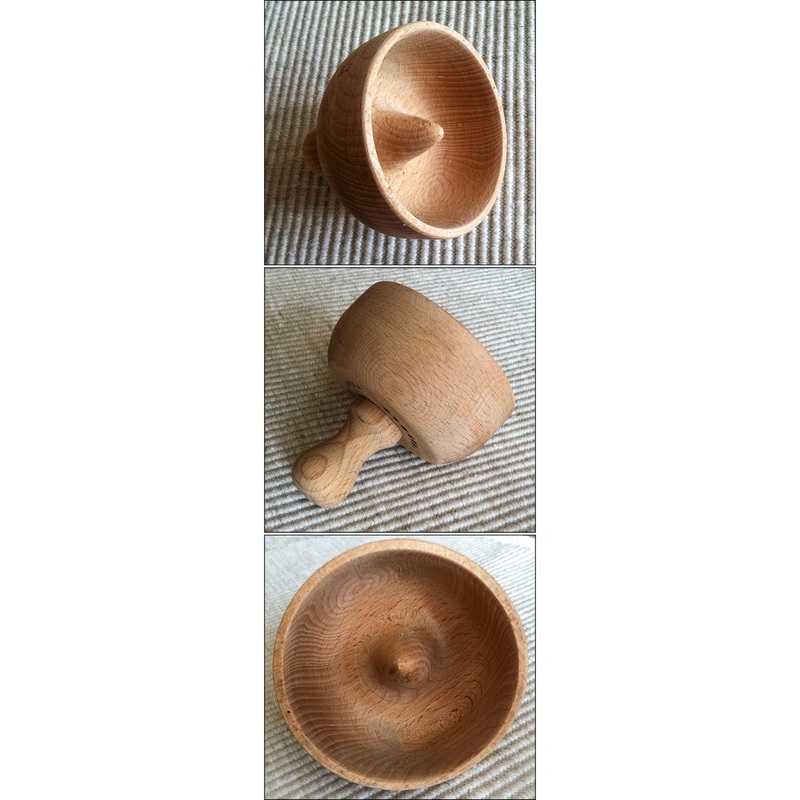 -2, yes 2, meat mallets. 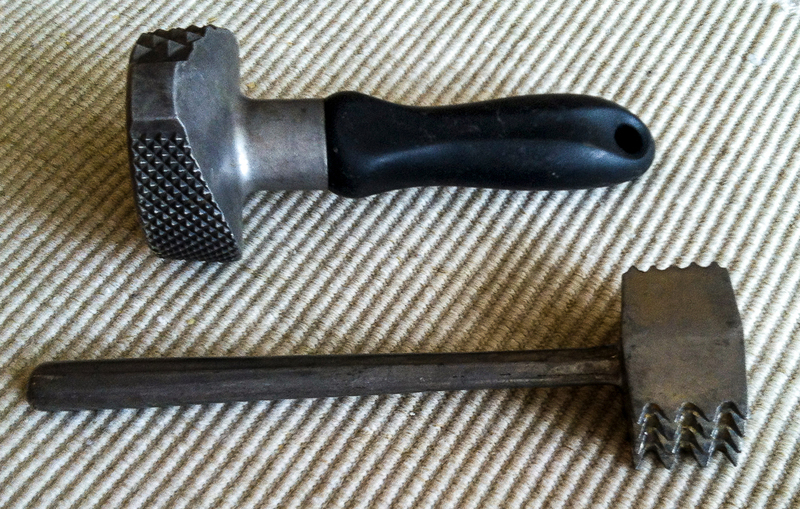 Back in the day when we were active scuba divers (and harvesting abalone was legal) the smooth side of the smaller mallet was used to pound abalone as well. 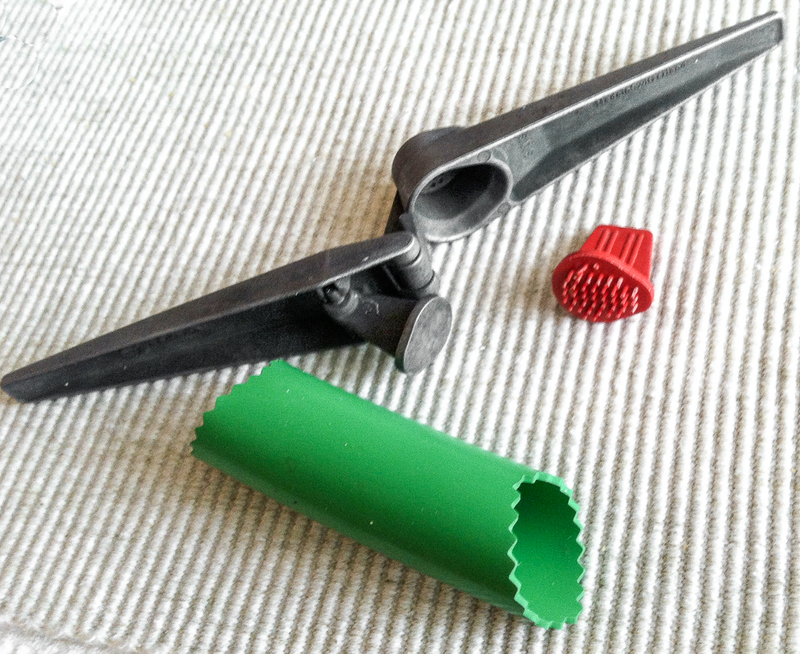 -an old garlic press and new plastic garlic peel cylinder. -2 hand scoops, plus another two I haven't located yet. 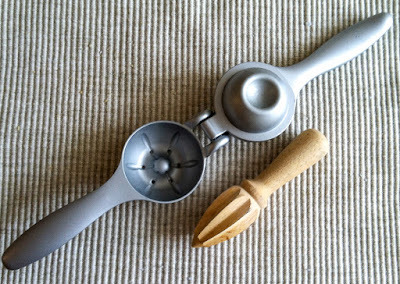 The 2-tablespoon round scoop sees heavy use with cookie dough and occasional use forming meatballs. 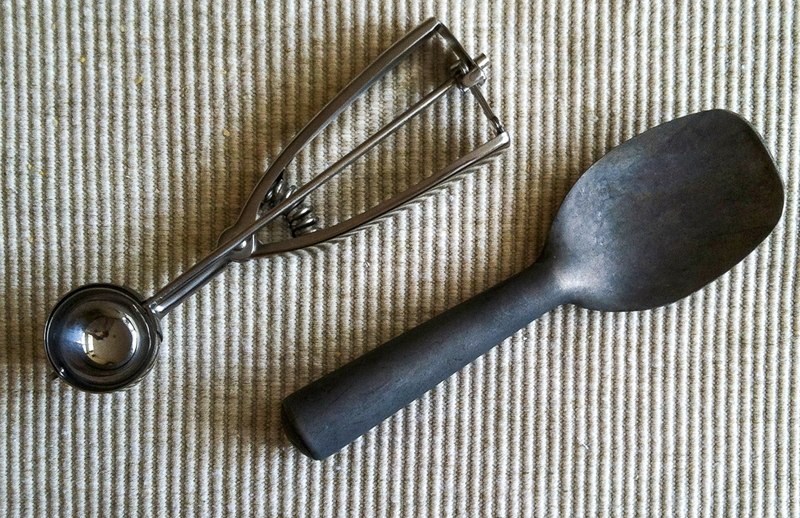 The paddle scoop was originally used in a restaurant, purpose unknown, but currently makes a sturdy ice cream scoop. 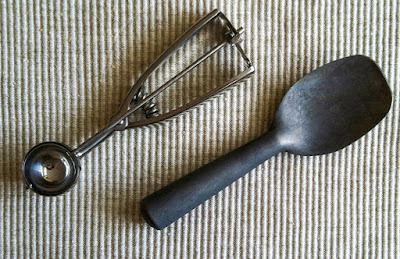 RL always knows where this utensil is hiding stored. 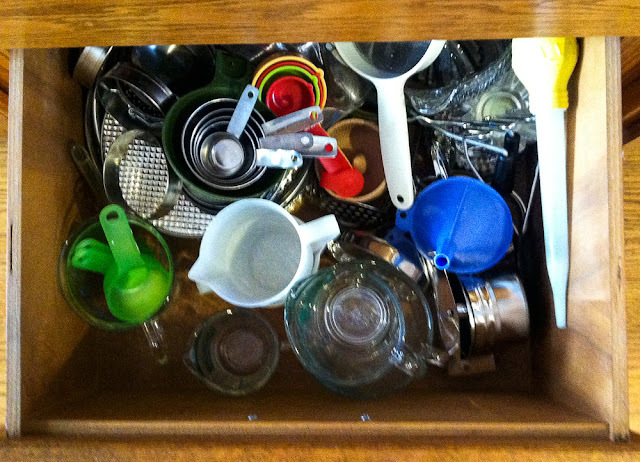 -there are plenty more drawers waiting to be organized, sorted, weeded, or whatever. Now I'm ready to quit for the day - or week - or whatever. When we built this house over 35 years ago I thought the kitchen storage would never be filled. While the cabinets and drawers aren't full yet, it's getting close. It's definitely time to pare the collection as I organize, since new treasures will need some space in the future. 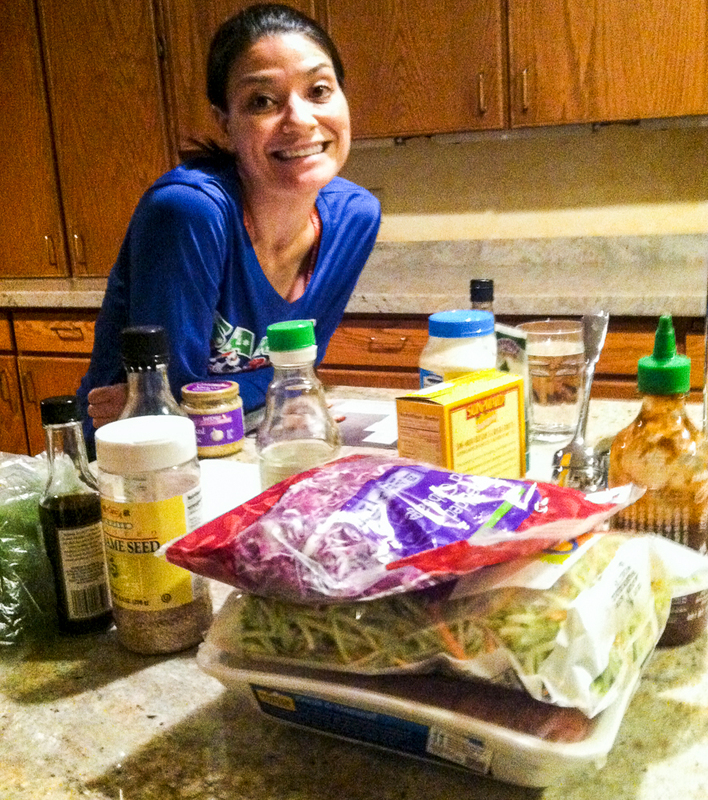 For a peek into other kitchens around the world, click on Maureen's blog Orgasmic Chef. You will find links to an interesting group of bloggers with a lot going on in their kitchens. Lately a new medication has messed with my tummy, tastebuds and appetite, and kitchen activity has been hit and miss. Looking for inspiration motivation I clicked through scads of pinterest photos, randomly searching for something tempting, something yummy that would feature the mushrooms and kale in my fridge. 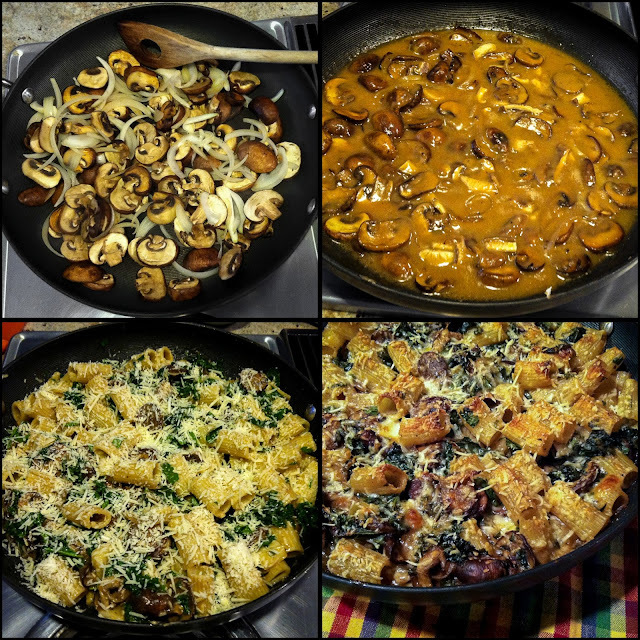 A photo from SmittenKitchen's "Mushroom Marsala Pasta Bake" caught my eye; visually appealing comfort food that might not challenge my tummy. So many of Deb's recipes are delicious and this one looked like a winner. I adjusted the ingredients, adding kale and substituting other items, but did follow the original recipe's steps. * Cook the pasta and soak the dried 'shrooms. * Brown the mushrooms and onions. * Combine 'shrooms, sauce and pasta and bake until browned. 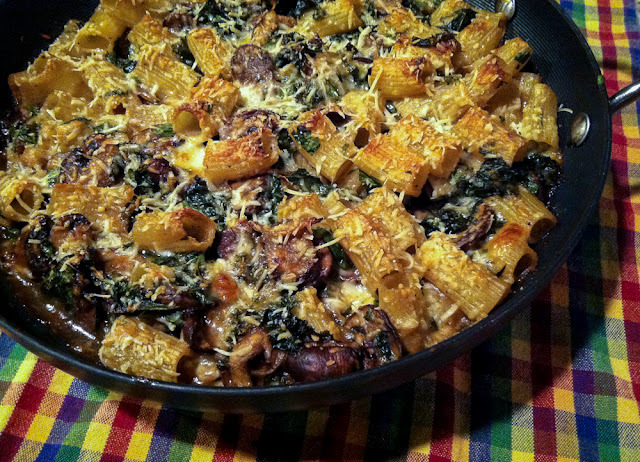 30 minutes to prep, 30 minutes to bake, and this pasta dish was on the table and ready to enjoy. It did not disappoint! This is not your old-school baked casserole, overly ooey-goey and full of processed ingredients. Oh no, this awesome dish eschews (omigosh, who really uses that word?) canned anything, celebrates the deep, earthy flavor of mushrooms, incorporates fresh kale for vitamins and color, and delivers an scrumptious, slightly booze-flavored cheesy sauce. Scrumptious? Yes, it was that good, Official taste tester RL repeatedly attacked sampled the pan of sauce with a Tablespoon and suggested we forego the pasta and skip the oven bake. Its true, by itself the sauced mushroom mixture is temptingly delicious, but I held out for the pasta and oven bake. Pastaless, I would pile a spoonful onto a toasted baguette slice for a hearty appetizer. It would be great finger food on a small bread slice or scrumptious, plated knife-and-fork fare on a large slice. Heat oven: To 400 degrees F.
Add oil to the now-empty pasta pot and heat to shimmering over high heat. Add fresh mushrooms; cook and toss until they begun to color but before they release any liquid. Reduce heat to medium-high; add onions, reconstituted dried mushrooms, salt and pepper and saute together until the mushroom liquid is evaporated. Add Marsala and cook mixture, stirring frequently, until liquid has nearly evaporated. Stir in the butter, mixing until melted. Using a strainer, sprinkle flour over the mushrooms; stir until completely absorbed. Add mushroom soaking water and stock, a few ounces at a time, stirring constantly with a wooden spoon. Each addition should be fully incorporated before adding the next. Repeat until all stock has been added. Let mixture simmer together for 2 minutes, stirring frequently; the sauce will thicken. Remove pan from heat. Add cooked pasta to the sauced mushroom mix and stir until combined. Add the kale, half the parmesan, all of the mozzarella and two tablespoons of the parsley; stir until evenly mixed. Sprinkle the top with remaining parmesan. Bake for 25 to 30 minutes, or until edges of pasta are golden brown. Sprinkle with reserved parsley and serve hot. Reheat as needed. For a crowd double the recipe and use a 9×13-inch or lasagna pan. My recipe for Pasta with Mushrooms, Kale and Walnuts offers a stovetop dish with similar ingredients but quite different results. Give them both a try. Not too excited about ground turkey? Get over it - the taste of these delicious Asian sliders might be reason enough to fill the freezer with this healthy protein. Healthy? Turkey contains vitamins B-6 and B-12, niacin, choline, selenium and zinc. That is good to know, but our attention was on the palate-pleasing flavor when these cuties hit the tastebuds. Lime, sugar, fish sauce, basil and garlic meld nicely with the turkey into a delicious Asian bite, one that easily handled the heat from any added sriracha and jalapenos. The generous handful of apple matchsticks provided a welcome crunch to the otherwise soft sandwich. Every bit of kitchen island and sink countertop showed signs of action during dinner prep. The dozen plus slider ingredients, and even more for the slaw, called for a lot of chopping, mixing and tossing. Still, dinner came together surprisingly quickly as each major component was prepped and set aside. Chef de Cuisine Hilary adapted this delicious dish from two recipes she found in the Nov. and Dec. 2015 issues of Shape magazine. Colorful, imaginative and fully loaded with sweet/hot/citrusy/tangy flavors, her turkey sliders were a fiesta on the plate and in the mouth. We politely nibbled the first bites of apple-topped sliders-with-slaw: bite... pause... register the taste... smile! Mmmmm, yes, we each inhaled the rest of our first slider in another bite or two and hurried back to the stove for more. 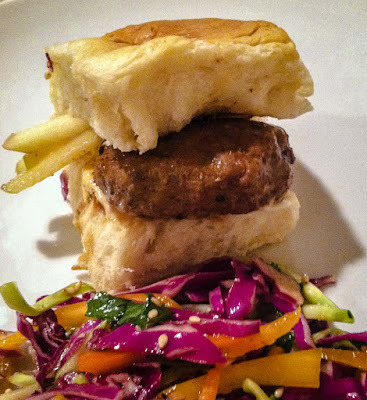 We are eager for another Asian slider dinner, soon please (especially if Hilary cooks).These sliders would make a festive party appetizer as well, with a large batch cooked and held in an electric skillet or on a warming tray. Anyone for a party? 1. Use a medium bowl to mix lime juice, sugar and 2 teaspoons fish sauce. Stir until sugar dissolves. 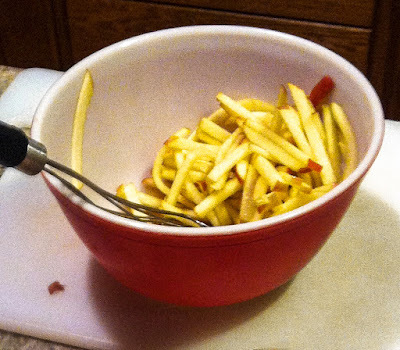 Add apple machsticks; toss to coat and set aside. 2. Use a small bowl to blend together the mayonnaise and 1 Tablespoon of the basil paste; set aside. 3. In a large bowl mix together by hand ground turkey, garlic, remaining 1 Tablespoon fish sauce, remaining 1 Tablespoon basil paste and lime zest. 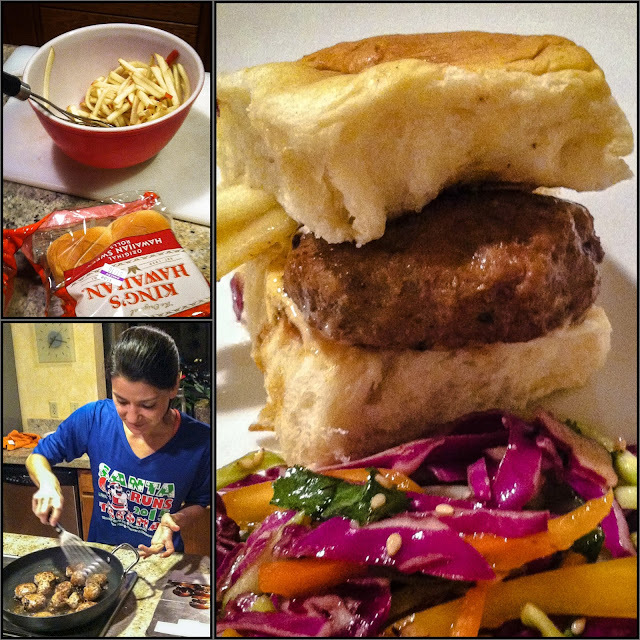 Shape into 8-12 meatballs or fat patties slightly wider than the slider buns..
4. Heat the oil in a large skillet and brown meatballs over medium heat until browned on all sides, about 10 min. 5. 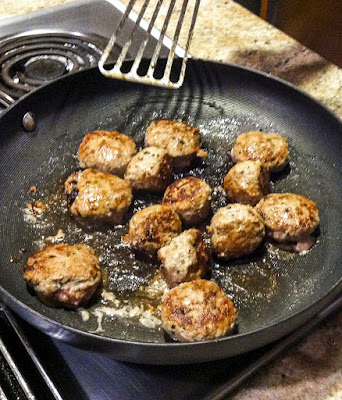 Drain the apple mixture; add the liquid to the skillet with the meatballs. Add water; bring to a boil and scrape up any browned bits from the skillet. Cook, turning occasionally, until cooked through and liquid reduces into a clingy glaze, about 8 min. 6. Spread basil mayonnaise on buns, top with apples and glazed meatballs. 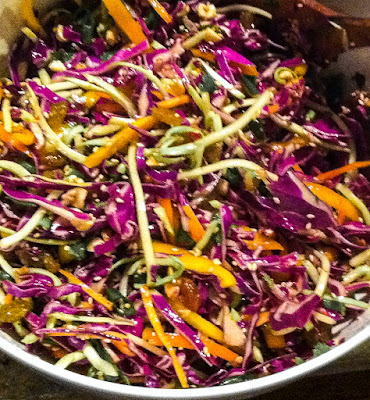 Serve with a side of Rainbow Sesame Slaw and offer optional hot sauce and jalapeno slices on the side. 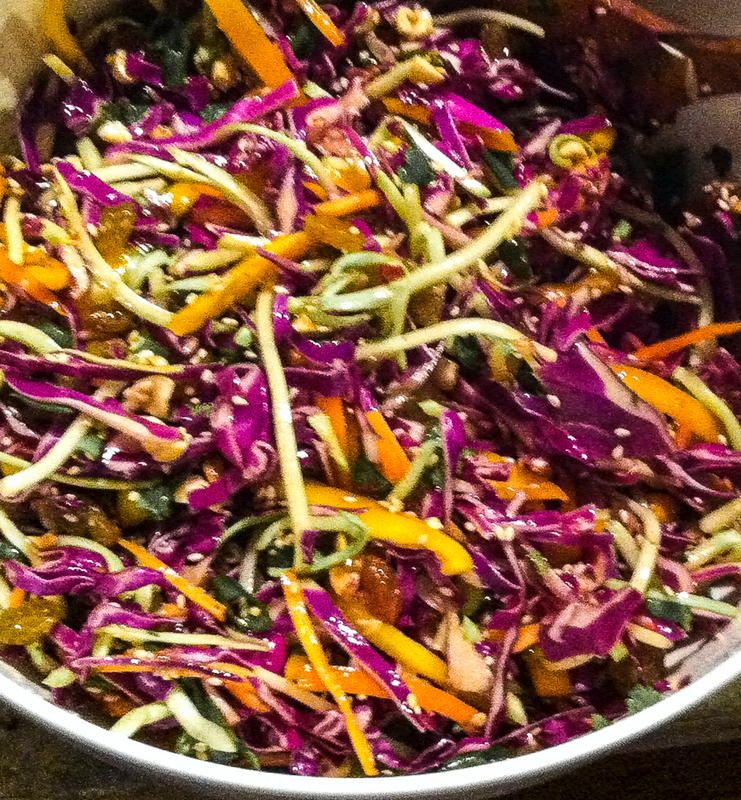 Use a large bowl and toss together the solids, broccoli slaw through ginger (if using). Add the dressing to the mixed slaw; toss gently to combine. If making ahead, toss occasionally to recoat the slaw and redistribute the dressing. "Baking is a science." I've read that before, an authoritative declaration that implies recipes are exact formulas not to be messed with. Maybe so, but I like to tinker with recipes. It's fun and occasionally necessary to match what's available in the pantry. Sometimes a big "Aha!" moment results, and occasionally we deal with disappointment or even a kitchen disaster. 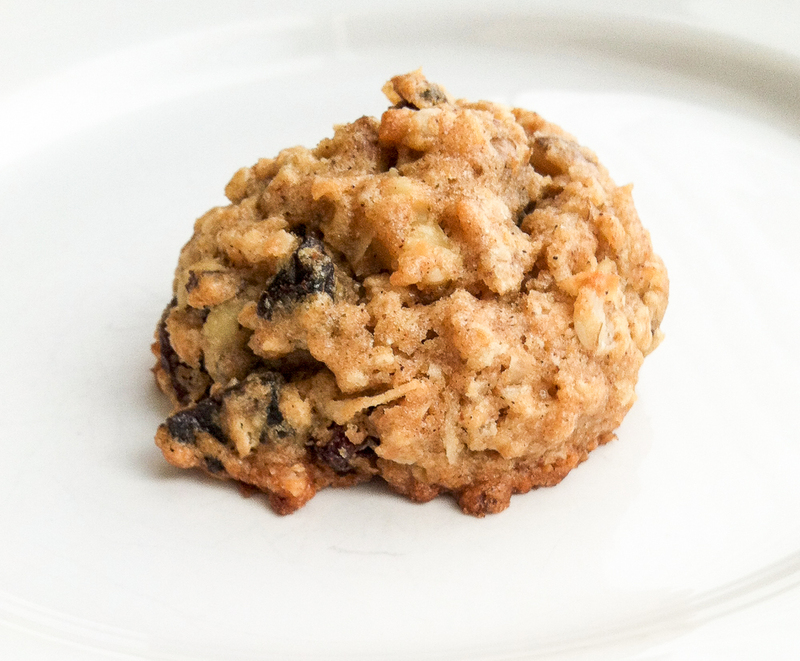 This week's oatmeal cookies were a good example of a happy, tasty and unplanned accident as I really messed around with the original recipe. I didn't want to deal with dividing up a soft, squishy cube of butter so I tossed the whole stick into the mixing bowl. Right, more fat called for more flour and why not toss in some whole wheat flour and a smidge of ground flax just 'cuz it might be healthier. Done; so far, so good I thought. Then the "accident" part came along. Cheers from the TV football game diverted my attention, ending any hope of thoughtful recipe tinkering. 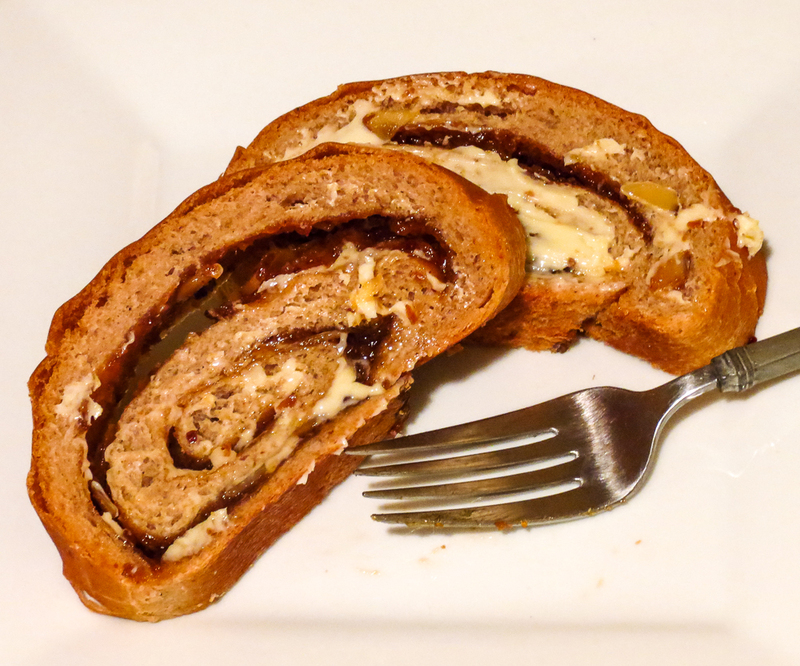 While watching the playoff action on TV I grabbed dark brown sugar instead of light and forgot to adjust the quantities of sugar, added baking powder instead of baking soda, increased the quantity of rolled oats and coconut, substituted dried prune bits for chocolate chips that I couldn't find, added almond extract and vanilla extract... and hoped for the best. The result to radically changing the ingredients and ratios? Beautifully soft, moist oatmeal cookie puffs, an amazing contrast to the usual flat and crisp cookies of the original recipe. Something(s) in all of this recipe tinkering impacted the appearance and texture of these cookies. I've considered the question of flat vs. puffy cookies before (link), but have not explored it systematically. I still don't know how to account for the change, don't really care. 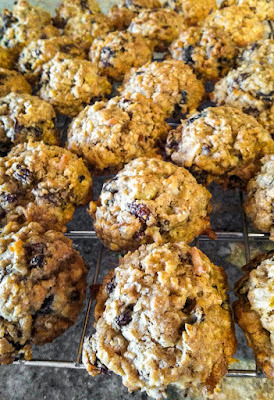 I do know I will make these puffy oatmeal cookies again; they disappear so quickly from the cookie jar. In a stand mixer, cream the butter and sugar until smooth. Add the egg, vanilla and almond extract; beat until fluffy. Sift and mix the flours, flax, baking powder, cinnamon and salt in a separate bowl. Add to the butter, sugar and egg mixture and mix until just incorporated. Use a large, heavy spoon and mix in by hand the oats, chocolate chips, nuts, dried fruit and coconut. Drop rounded tablespoon-sized balls of dough onto silpat-covered cookie sheets, spacing at least 2 inches apart. Bake for 12-15 minutes, until the edges brown slightly. Rotate the baking sheets after the first 8 minutes. Remove to a baking rack to cool. Store in a covered container. 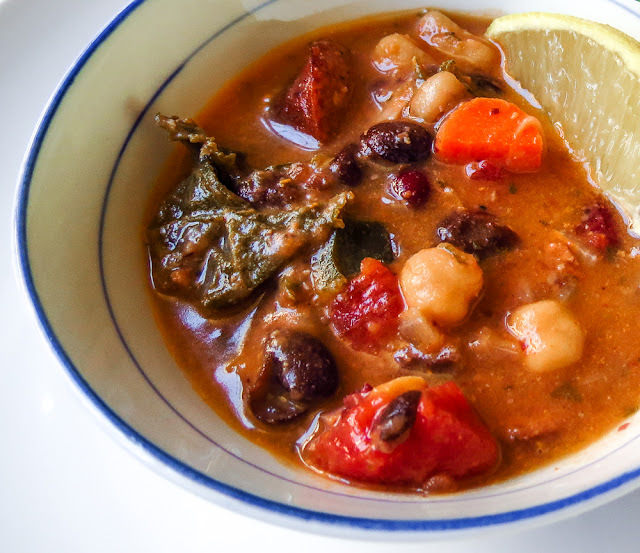 Bean soup - when did it turn into such a taste treat? Not when I was a youngster, dreading Mom's endless pots of Split Pea or Navy Bean Soup. Not as a teenager, politely but firmly declining Ten-Bean Soup during Rose Parade/Rose Bowl events. Years later I raved about the Lentil Soup served in the basement cafeteria of Raitt Hall on the University of Washington campus. My kitchen files hold a tattered and splattered 3x5 file card from the 70's that includes both the recipe and many years of adjustments to a dynamite Cuban Black Bean Soup. Somewhere over the years I went from a bean soup hater to bean soup lover... okay, I'm still not too fond of traditional Navy Bean Soup. Here's a recipe I'm playing with this month, tweaking repeated batches since the soup adapts well to changes in seasonings and base ingredients. That adaptability keeps us well-fed without the boredom of repetition. As written, the original version yields a hearty, well-flavored broth nicely loaded with beans and bits of sausage and vegetables. Beyond a few focused minutes of chopping, slicing and dicing, this kettle of goodness requires minimal hands-on effort and little time. The flavors do benefit from an overnight rest - time to blend and mellow - but the soup is tasty on day one. Double the recipe if you are going to feed a crowd. 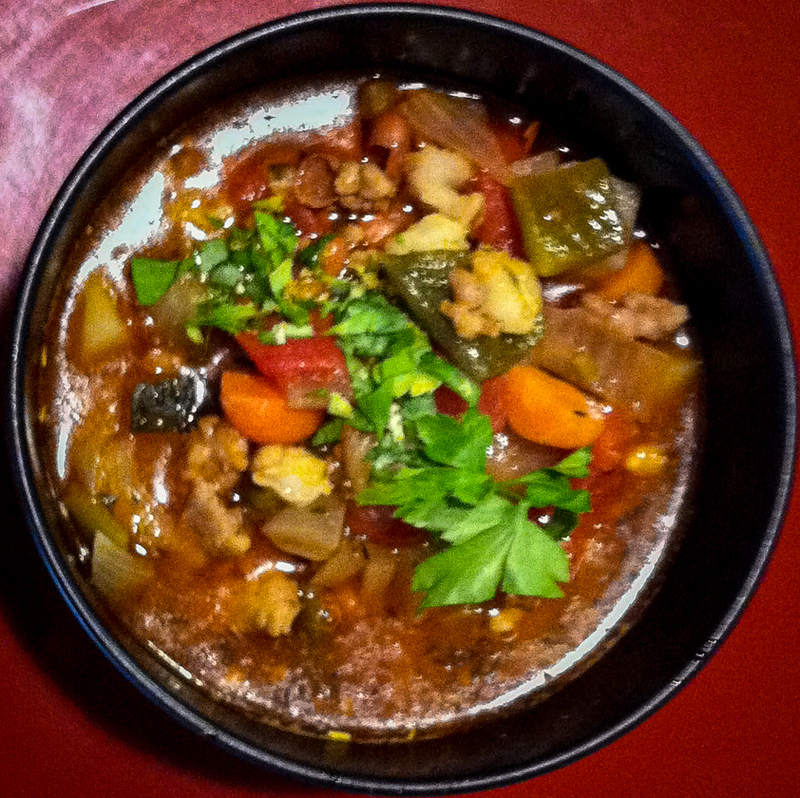 This weekend's kettle of soup was a spicier version, leaning more Southwest or Tex-Mex in spicy heat. While not as thick as a chili it was heading in that direction flavorwise. I can almost hear some diehard chiliheads gasping in horror: real chili doesn't have any beans (nope, none, zero, zip, nada) and this is such a bean centric recipe. Relax, I'm only talking about the chili flavors here, not the solids. 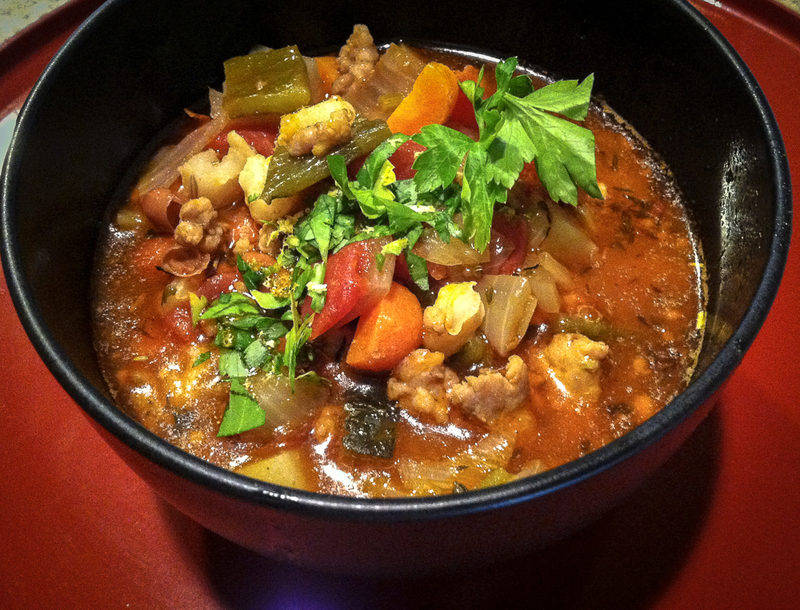 Do you have a favorite legume soup? 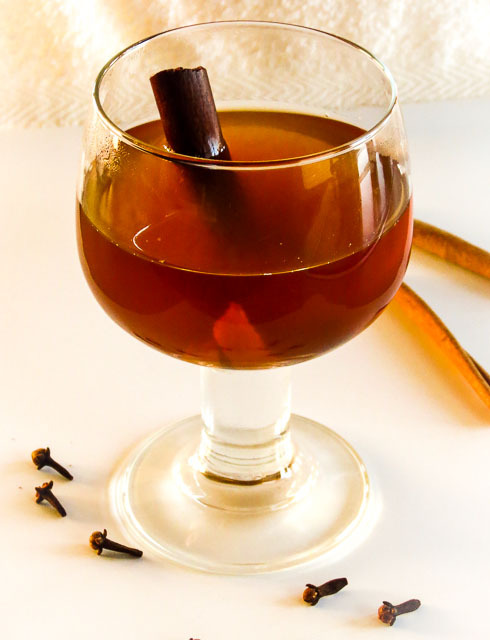 Share the recipe or a link to it in a comment. Warm the oil in a large soup pot over medium-high heat; add the bacon and cook until crisp. Set aside on paper towels to drain: chop and reserve as garnish. Sauté the sausage coins in the oil and bacon fat to brown slightly. Add the onions to the pot and cook until softened, 3 to 4 minutes. Add the carrots and poblano and cook until barely softened, another 3 to 4 minutes. Add the next 11 ingredients, beans through thyme. Cover the pot and bring to a boil; reduce the heat and cook at a low simmer for 20 minutes. Taste and season with salt and pepper as needed. Let cool to mellow and blend the flavors (or skip this step if you are hungry and in a hurry. Remove 1/4 of the soup to another container and puree with a stick blender. Return the pureed soup to the larger soup pot. Reheat the soup over medium heat; add the kale and ham (if using), cooking to heat through. Taste and adjust seasonings - I typically add Green Tabasco and red wine vinegar at this point. You may want to offer them at table to suit individual tastes. Ladle the soup into warmed bowls and garnish with a generous sprinkle of gremolata and bacon bits. (Don't skip the gremolata - it makes a difference!) Offer grated Parmesan, hot sauce, olive oil and red wine vinegar at the table as well. ...substitute cumin, cilantro and Mexican oregano for the rosemary and thyme. ...add fresh cilantro in addition to the fresh parsley. ...substitute 1 pound crumbled pork sausage or chorizo in step 2 (drain off the excess oils) and skip the ham in step 5. Life has been peacefully quiet during the past month, yet the weeks have flown by on the calendar. How did 2016 arrive so quickly?! 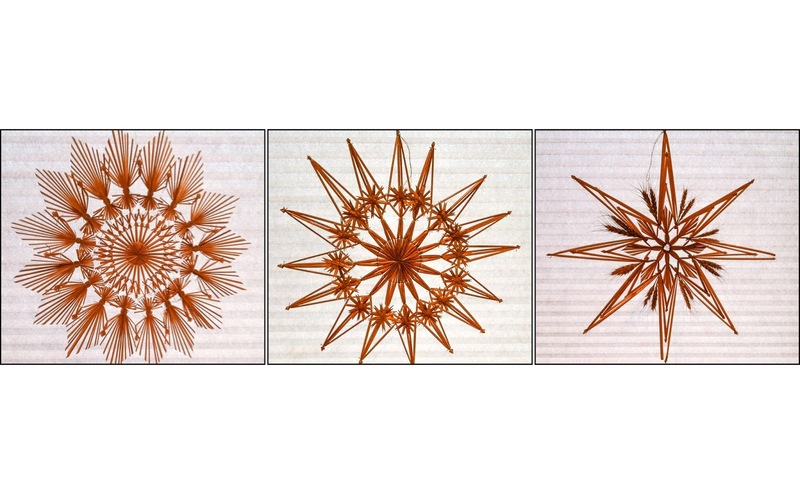 Traditional Austrian straw stars, designed to celebrate Advent, still hang in my window. Purchased years ago at the Salzburg Christkindlmarkt, these handcrafted treasures will remain on display a bit longer, at least until the end of this month. They recall past holiday celebrations plus some wonderful travel adventures and are too festive to hide away in the Christmas bins. I'll just rename them "snowflakes" and pretend there's no timeliness issue. December brought some new additions to the kitchen. Friend Margi returned from Tofino (on the wild west coast of Vancouver Island, B.C. Canada) with a gift copy of this delicious cookbook. Delicious? Yes! 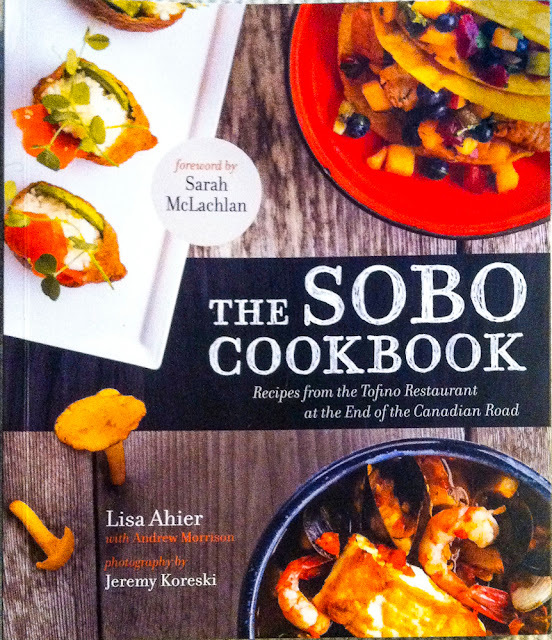 the appealing recipes, text and photos all seem scrumptious and I can't wait to cook from this book, beginning with the recipe for smoked salmon chowder. 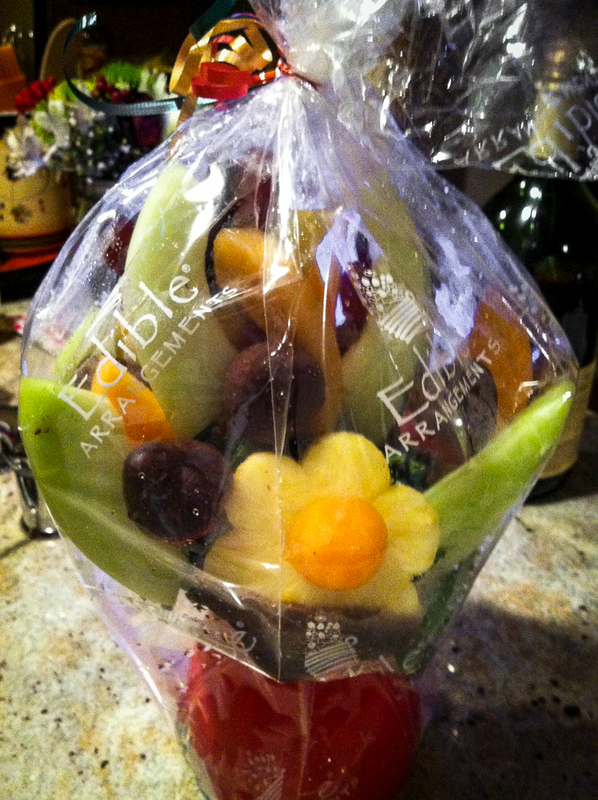 Friend Laci sent us a fresh fruit and chocolate Edible Arrangements treat. The fruit array included some amazingly sweet pineapple flowers, perfectly ripened chocolate-dipped strawberries and grapes, flavorful cantaloupe spears and some crisp but fairly bland honeydew melon spears. Of course we sampled the chocolate-covered fruit first. The red ceramic vase remains as a useful, multipurpose vessel. 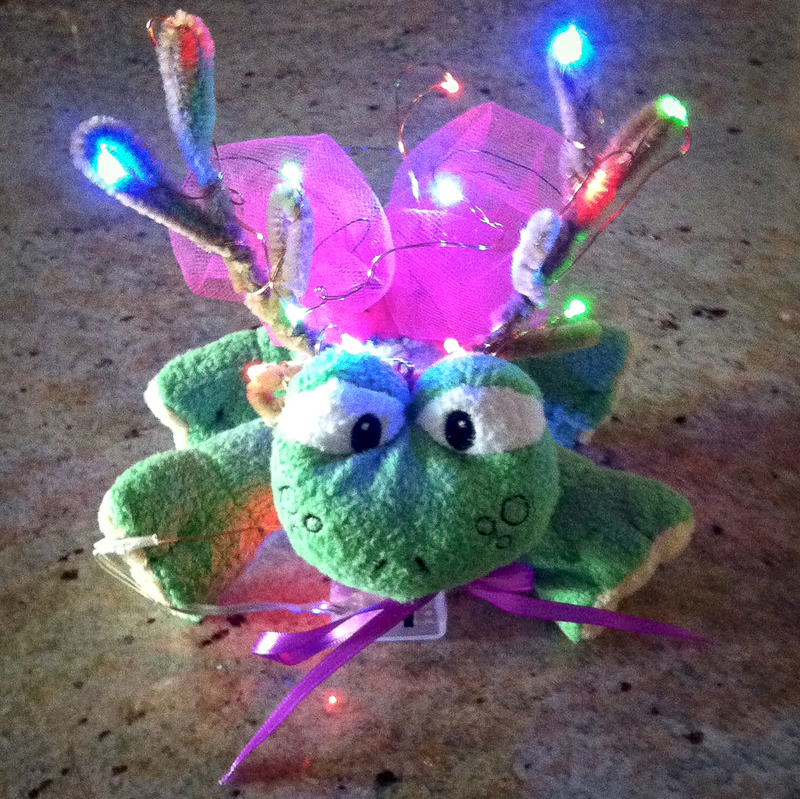 Imagine our surprise when the kitchen's resident Green-Frog-with-Pink Wings morphed overnight into the Green Freindeer! Niece Hilary and Ron have a long-running story line going with this little guy, but it's Hilary's creativity that produces the visuals. Hmmm, do we sound slightly mad? Well, you can't imagine the mischief blamed on this little critter. A small bottle of Bulgogi sauce leapt off the store shelf and into my cart, promising a quick, shortcut version of tasty Korean BBQ Beef. It lived up to its promise and added amazing flavor to braised short ribs, but now I'm eager to create bulgogi sauce from scratch. It might take another restaurant visit or three to educate my palate... set expectations... and enjoy bulgogi and kalbi at some of Seattle's notable eateries (link) while I continue the online search for recipes to try. In my kitchen the menu has lately leaned toward old favorites, dishes too easy and familiar to merit a special blog post. I did grab a few iPhone shots to show that I have actually spent some time at the stovetop and oven. Of course I cheerfully turn over kitchen action to Hilary and/or RL when they insist. * Rolled almond and nut coffeecake, with some whole wheat flour added to the usual AP flour, disappeared quickly. The slather of butter on these slices wasn't really necessary, but some habits die hard. 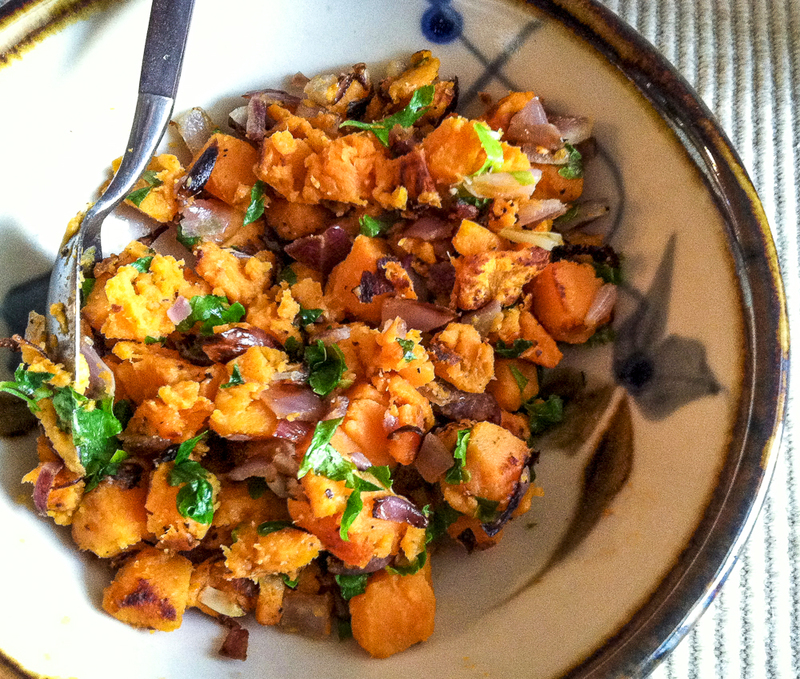 * Sweet potato-red onion hash filled my bowl at breakfast and made a tasty lunch item as well, though RL politely refused to sample this creation. Orange vegetables are never his favorites, so he reheated some borscht from the freezer instead. 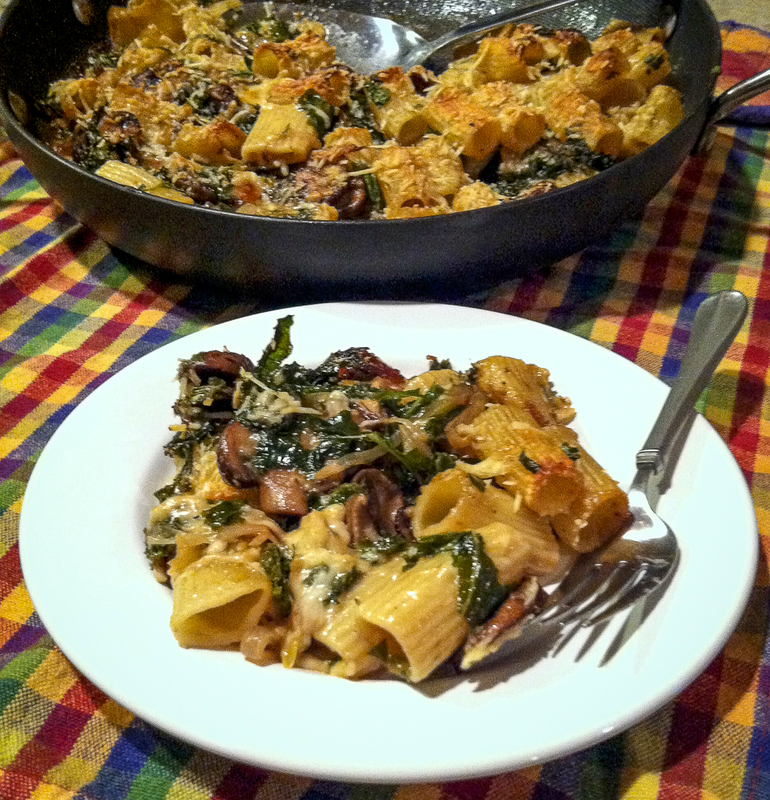 Both dishes are colorful comfort food, welcome on cold, gray winter days. * Still-warm loaves of sourdough bread and a bottle of wine were hostess gifts when we joined friends for dinner at their new condo. While the lemony Parmesan round with walnuts was a hit, it was the sour cherry boule with lemon zest and pecans that received rave reviews at dinner and (as reported via email) toasted for breakfast the next several mornings. 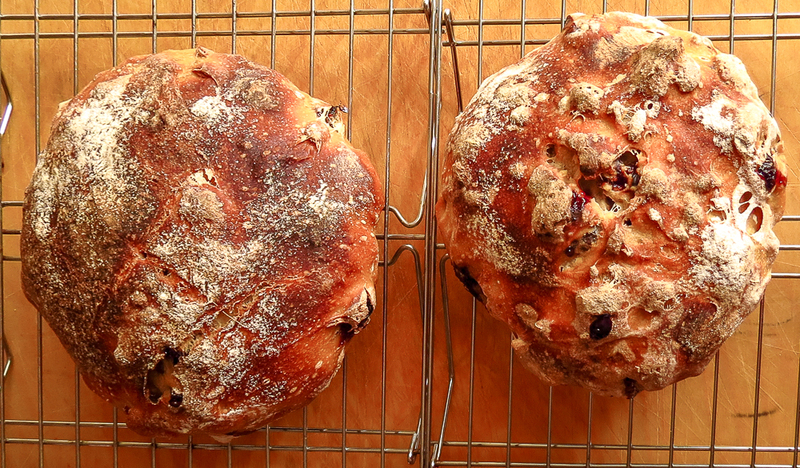 This success called for another round of sourdough baking - as soon as we returned home after dinner I mixed another batch of dough with cherries, lemon and nuts for us to enjoy the next day. Old Faithful, my sourdough starter, has been busy lately producing tasty breads, quickbreads, pizzas crusts and waffles. Oh yes, I do have breadaholic tendencies. Here's wishing you and yours a healthy and peaceful 2016 - Happy New Year! Now take some time and enjoy visiting other kitchens around the world via the monthly In My Kitchen roundup at orgasmicchef.com. Maureen is taking over the IMK reins as host at OrgasmicChef, giving founder Celia some well-deserved time off.